As an experienced Freshdesk Consultant I want to bring multitudes of features brought to you by Freshdesk to improve the success of your support team. To collaborate with your desired team members right away is crucial to an efficient customer support. Yes! thats what our new killing feature “Team Huddle” from Freshdesk says. Freshdesk has always been thoughtful about the customer support can convert into customer delight. Now, when one support engineer is stuck with an issue he gets to collaborate then and there with his teammate who has aced the solution for the given issue. This quickens the process of resolving customer issue. 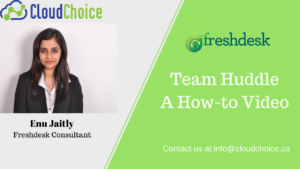 I as a Freshdesk consultant enjoy everybit of supporting and solving my customer issue and I think its only fair when I share how Team Huddle comes in handy to maximize the efficiency of collaborating with the team. So I made a quick video of how Freshdesk does this magic. The above video helps you understand this cool feature extensively. As a customer support team member when you need help with resolving one of the customer tickets simply @mention one of your teammate tagged under the particular project. You may even have a group of team members associated with the same project and ping your need in this group. As simple as a google hangout ain’t it? This reduces the resolution time without having to switch to another email or chat tool to seek help. Shift your team conversations to Freshdesk’s Team Huddle to ensure important information about a particular ticket is immediately available when and where you need it and not lost in another external chat tool. Make sure to tag your team member on the exact part of the ticket you need help with by highlighting a specific phrase of the text. This helps them in responding faster without hovering over the entire thread. Let’s work together and support our customers seamlessly! I feel liberated when I help my clients address their business challenges. CloudChoice gives me the freedom to wear multiple hats which helps me grow as a complete client-engagement specialist.